OPENCACHING NORTH AMERICA • View topic - What is BIT Caching(tm)? 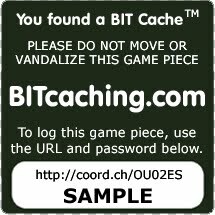 We have a new cache type called a BIT cache(tm). BIT stands for "Bound ID Tag" to represent that the cache tag is bound in plastic, better known as laminating it. There is no container and no log book but it is still a physical cache. After getting their coordinates the hider creates the cache, selecting the BIT cache type. A log password is required otherwise creation will fail. Once it is created, the user visits the edit page where there is an option to print the bitcache tag near the bottom of the page. The script pulls the necessary information to create the tag from the database and passes it to http://www.bitcaching.com/print.php where the tag is auto-generated and ready to be printed. It has been tested in IE, Firefox and Chrome and views just fine, but Chrome cannot print them (yet). You are free to create your own template designs and sizes as long as you include all the information shown on the official version. The official version is subject to change but you'll be notified if and when this happens. The tag can then be placed and the user edits the listing to mark it Ready for Search after it has been approved by the OC Team. The tags are one-sided and can be attached to any flat surface or hung using a wire tie or similar device. To log the find, the seeker simply visits the cache listing page by scanning the QR code or opening the shortened URL in the phone or computer browser. All BIT caches require a password to be logged and the password is printed on the tag. They enter it in and log the find. You only need a GPS to play, but smart phone users can go paperless! Everyone else can just write down the password and the shortened URL from the bitcache and log it when they get to a computer with internet access. Yes, we know some people will cheat and share the password. If someone wants to do that, then they are only cheating themselves. Below are acceptable examples of BIT caches. Re: What is BIT Caching(tm)? So...are these meant to be stand-alone tags and/or placed in a cache container in lieu of a log sheet? From my reading, they're really intended to be "free" of a container, since you can't select a size for them. At least, that is how they're currently configured. Yes, stand alone. If you use a container, you then have a traditional cache where a log sheet would be standard. This cache type is to allow placement in many more places where a container would not be appropriate or feasible. They are meant to be an alternative cache type and not to infringe on any other cache type already enjoyed by other geocachers. I'm still not perfectly clear on why there has to be a separate site only to redirect you back to OCUS. Couldn't you just put a link/section to "BIT Caching" on the "Main Menu" section of the main OCUS site or maybe a button on the button bar across the top along with Trackables, Forum, etc? Those unfamiliar with OCUS at the beginning might think that this is yet another separate thing altogether. 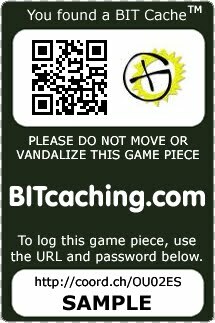 We don't have separate sites for GuestBookCaching.com, DeadDrop.com, etc. Correct me if I'm wrong, but really the only thing that is needed at the BITcaching is the ability to print the tags out. Everything else just resides on OCUS. I know it's a new concept, but it is still just one of the TYPES of OCUS caches. This is all just my opinion, for what it's worth. I'd just as soon see a tag that has Opencaching.US on it. 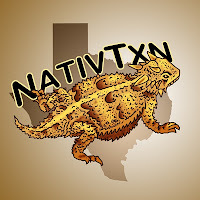 NativTxn wrote: I'm still not perfectly clear on why there has to be a separate site only to redirect you back to OCUS. Couldn't you just put a link/section to "BIT Caching" on the "Main Menu" section of the main OCUS site or maybe a button on the button bar across the top along with Trackables, Forum, etc? Those unfamiliar with OCUS at the beginning might think that this is yet another separate thing altogether. We don't have separate sites for GuestBookCaching.com, DeadDrop.com, etc. Correct me if I'm wrong, but really the only thing that is needed at the BITcaching is the ability to print the tags out. Everything else just resides on OCUS. I know it's a new concept, but it is still just one of the TYPES of OCUS caches. Basically, for added awareness. You can use a link to OCUS instead of BITcaching.com if you wish. I updated the Wiki to include all the info from the other site. Is it just me, or do these seem to be designed to be more visible that traditional caches? I can't really picture camouflaging and hiding something the size of a business card and making someone search for it. It almost seems like these really are more about the location. That's just my take on it though. Thoughts? I don't see these generally being hidden in the middle of the woods, like a traditional cache, if that is what you mean. I guess that these will be located in more urban areas. There also seems to be a trend of them being used for caching vehicles. DudleyGrunt wrote: I don't see these generally being hidden in the middle of the woods, like a traditional cache, if that is what you mean. Yeah, I'd say it's more an urban thing. I made my vehicle a Bitcache too. DudleyGrunt set the example there. If I'm not mistaken, the first ever one was his vehicle? I suppose my only other one is "in the woods", although only 15 feet or so on the edge of a cemetery. Still looking at ideas for more.